At 22 years of age, EagleVail’s Mikaela Shiffrin is now all alone in eighth place on the all-time women’s World Cup victory list with 34 wins after claiming a giant slalom by nearly a full second in Courchevel, France, Tuesday. Shiffrin’s third win of the season clinched an Olympic berth for the 2018 Pyeongchange Winter Games, and made the 2014 slalom gold medalist a favorite to also claim a GS medal. Shiffrin also has wins in slalom and downhill this season. 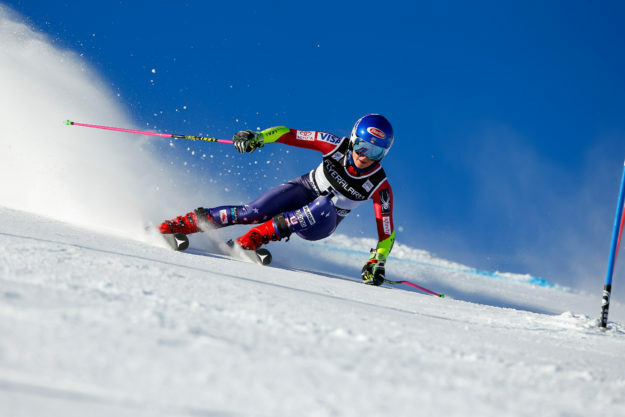 The victory pushed Shiffrin into second place on the all-time victory list for Americans, breaking a tie with retired men’s superstar Bode Miller. Shiffrin now trails only Vail’s Lindsey Vonn, the all-time women’s leader with 78 wins. Vonn, 33, had won six World Cup races at Shiffrin’s age. Coming off a victory in a super-G in Val d’Isere, France, on Saturday, Vonn skipped Sunday’s race with a sore knee and also did not compete in Tuesday’s GS. Shiffrin beat out GS world champion Tessa Worley of France by a combined two-run time of .99 seconds on Tuesday. Tuesday marked just the fifth GS win of Shiffrin’s career, with most of her victories coming in slalom. The defending overall World Cup Champion has totaled 621 points so far this season following Tuesday’s win. Germany’s Viktoria Rebensburg, who won the first two giant slalom races of the season, fell further behind in second following a 14th-place finish. Shiffrin also moved into the overall giant slalom World Cup lead Tuesday with 225 points. Rebensburg is second with 218 points. She also leads the overall downhill and slalom World Cup standings.